The verdict of the Sessions Court in Mumbai holding Bollywood actor Salman Khan guilty of culpable homicide for his act of ramming a roadside bakery with his Toyota Land Cruiser on September 28, 2002, killing one person and wounding four others sleeping on the pavement outside, and sentencing him to five-years’ rigorous imprisonment and a fine of Rs. 25,000 has sparked extreme reactions, with the common man so to speak, welcoming the verdict, and Bollywood celebrities and some other high-profile sympathizers expressing shock at the judgment and expressing their solidarity with Salman Khan. Even among the celebrities and ‘twitterati’, opinions have been divided. In Allauddin Milan v. State of Bihar [supra], the Supreme Court had ruled that all trial courts, after pronouncing an accused guilty, must adjourn the hearing on quantum of sentence to another day to enable both the convict and the prosecution to present material in support of the quantum of sentence. A bare reading of the newly added proviso to Section 309(2) of the Code of Criminal Procedure goes to show that the dictum laid down in Allauddin Mian is in direct conflict with the statutory provision. Though Mr. Rashid had written his article in the context of the judgment rendered by the Bangalore trial court in the disproportionate assets case, it can be seen that in both the ‘2002 hit and run case’ and the ‘disproportionate assets case’ , Salman Khan and Jayalalitha respectively, were convicted and sentenced on the same day. Interestingly, Mr. Rashid had penned his 2014 article to clarify the legality of ‘same day conviction and sentence’ after the very same reporter in the very same newspaper who has now questioned the legality of imposing the sentence on the same day as the conviction, had expressed doubts about the Bangalore trial court having violated the Supreme Court's mandate by convicting and sentencing former Tamil Nadu chief minister J Jayalalitha on the same day, September 27, in a disproportionate assets case. A reading of the two reports by the same reporter in the Times of India shows that he has committed the same mistake in his reporting today. While it may well be possible that he or the Times of India may not have read Mr. Rashid’s 2014 article in Live Law, it is indeed a mystery as to how the reporter could have been ignorant of the proviso to Section 309(2) of the Code of Criminal Procedure or about the Supreme Court’s subsequent clarification of the dictum laid down in Allaudin Mian, in Sevaka Perumal (supra) had not been adverted to in his latest report questioning the propriety of the Mumbai Court in pronouncing the sentence on the same day that it convicted Salman Khan. 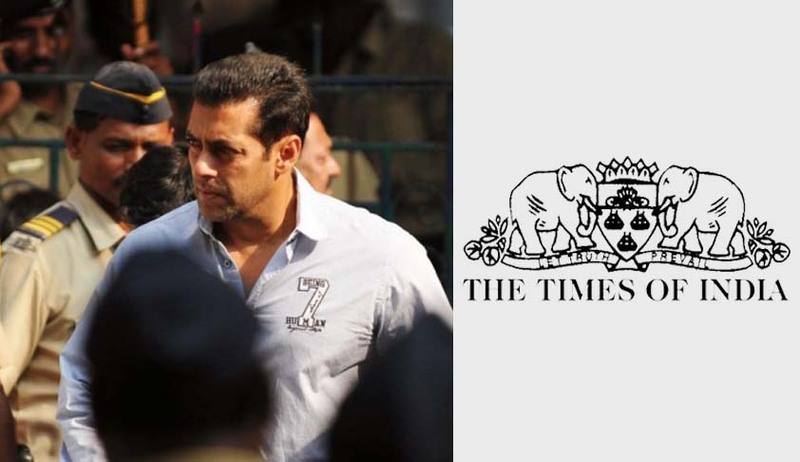 The result of this advertent or inadvertent omission by the reporter of the Times of India will naturally be that the gullible reader, not well-versed in law, may wrongly get the impression that the Mumbai Court has committed a grave illegality and that Salman Khan had got a raw deal from the Court, when in law, there is no illegality, much less any infirmity in trial judge D W Deshpande’s approach. Mr. Rashid and indeed, the rest of us might not have imagined that the Times of India would be caught committing the same mistake again, but we have been proved wrong: The Times of India has been caught on a wrong foot, not once, but twice now! Surely, ignorance is not bliss? !